State of Agile Community — do Scrum Masters have the right competences ? On 13th June we’ve attended the biggest agile community event in Slovak & Czech Republic — Agile Open Space as a general partner. More than 100 Scrum Masters and Agile Coaches from Central and Eastern Europe had the chance to exchange knowledge and experience from their agile transformation projects thanks to the unconference format. We’ve used the opportunity of having significant part of the agile community at one place and offered them an assessment focusing on Scrum Master and Agile Coach competencies. In this blog post, we would like to share with you some of our findings and a few interesting outcomes of this assessment. Just before the conference, Effective communication has been chosen in a poll by the conference’s participants as the most desired skill-set to be offered for testing. People who signed-up for the testing were interviewed by our Scrum Coaches. Those who also agreed to share their results (anonymously), provide a great example os such testing in the next paragraphs. One’s score for this competence is then an average of marks from all answered interview questions (through Competency Based Interview). ● Receiving part — sometimes, when working on communication skills, the sending part tends to be the focus. Yet, these two parts are just different sides of the same coin, equally important for both effectiveness and efficiency. In the field, agile practitioners must very well understand communication in all forms, from various people and in many contexts. ● Sending part — being heard during an agile transformation is as important as during any agile or Scrum ceremony. Using this skill-set results in “making things happen” — one of the reasons why Scrum Masters and Coaches are able to innovate, for example. The same complexity as for receiving communication applies here as well. Let’s talk some numbers first. We assessed together 13 various candidates. The score a candidate could achieve was in range 1,0 - 5,0, where 5,0 is the best rating. As you might expect, in the group of tested Scrum Masters, Managers and various agile practitioners, there were few outstanding communicators. The overall achieved average score of 3,869 only confirmed our expectations. ● Outstanding communicators — Candidates (23% of the group) with outstanding communication skills and assessment score between 4,6–5,0. ● Communication professionals — Candidates (62% of the group) with great communication skills and assessment score between 3,7–4,6. ● Communication juniors — Candidates (15% of the group) with good communication skills and assessment score between 2,8–3,7. A bit more surprisingly though, there were no people from the other part of the spectrum — underperformers or poor communicators. Sure, some of our “test subjects” were below the average, but please note here that the average was rather high (again, a pleasant surprise) and still in a range for a Scrum Master that we would recommend for this role. In terms of overall feedback, (fortunately!) there was no specific point to suggest in order to „fill a gap“ in any of the tested areas. We are confident to say that our colleagues from Czech & Slovak Republic are good communicators! Don’t underestimate the receiving part of communication — consider gaining experience in fostering discussion (rather than just send/receive information in 1:1 setups) and formulating opinions (especially unpopular ones). Pay attention to have everyone „on the same page“ — especially in groups, facilitate any discussion in a manner of common understanding of both the facts and the goal of the discussion. 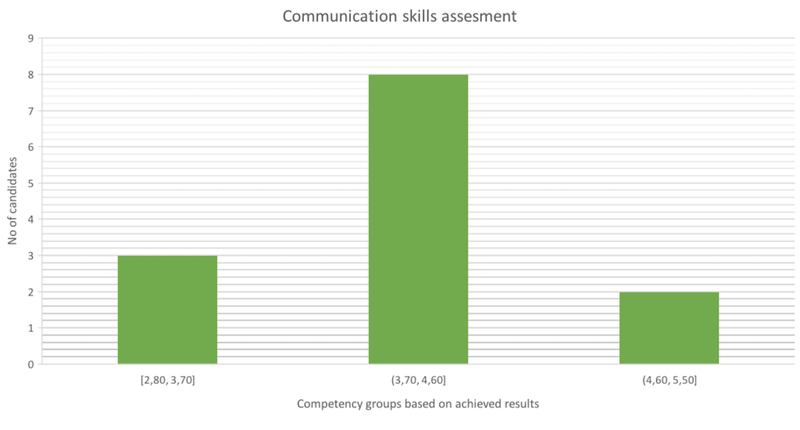 Testing only one out of five competencies would normally have effect on comparing each participant’s overall score. But for the sake of this testing and with the chosen focus, results still paint a nice picture of effective communicators for our agile practitioners. The Scrum Master Competency Model (SMCM) was created as part of ableneo’s internal Research & Development program. It is combining engineering know-how, experience from several agile enterprise transformation projects and a behavioral model used in Psychology. The goal of SMCM is to provide a holistic view on key Scrum Master’s competencies and give a clear recommendations / personal development guide for both Scrum Masters and Agile Coaches who are willing to improve their skills. Our model is focused on 5 key competencies and through lenses of a behavioral model assess candidate’s skills as objectively as possible. The model is aimed to enable individuals and teams to identify and improve critical parts of their skill-sets, crucial for building any agile organization. If you are interested in participating, or have any questions related to our model, let us know at info@ableneo.com. State of Agile Community — do Scrum Masters have the right competences ? was originally published in ableneo People on Medium, where people are continuing the conversation by highlighting and responding to this story.